People's Choice Festival. Image courtesy People's Choice Festival Facebook page. 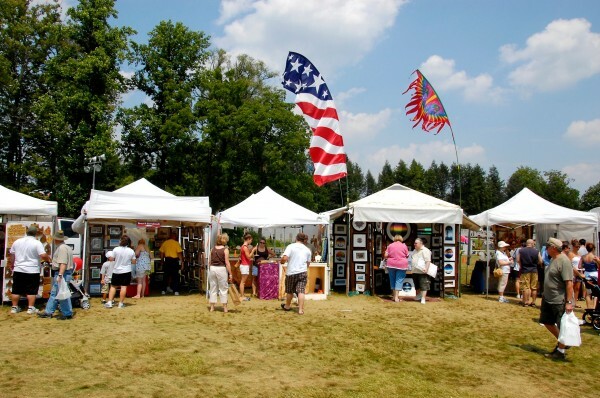 - While the focus is on, of course, the arts, both the Central Pennsylvania Festival of the Arts and the People’s Choice Festival of Pennsylvania Arts and Crafts offer opportunities to sample and purchase local food products. The Specialty Tent at the People’s Choice Festival is a showcase of local foods and wines, and there are six local food producers selling their wares at the Central Pennsylvania Arts Festival. - Also at Arts Fest, the Penn State Berkey Creamery is celebrating 150 years of amazing ice cream by debuting a new flavor and are leaving it up to you to name it. - Be sure to hit your favorite farmers market this weekend, as we are more or less in peak season for local produce. For example, cling peaches have arrived at Way Fruit Farm. North Atherton Farmers Market is holding an ice cream social tomorrow from 10:00 a.m. to 2:00 p.m.
- Believe it or not, now’s the time to plant for fall veggies. Tait Farm has a variety of fall seedlings ready for planting, including kohlrabi, broccoli, kale, and more. - Harrison Wine Grill’s herb garden is in full swing, so stop by for a delightful summer-inspired cocktail featuring Tait Farm shrub and Big Spring vodka.